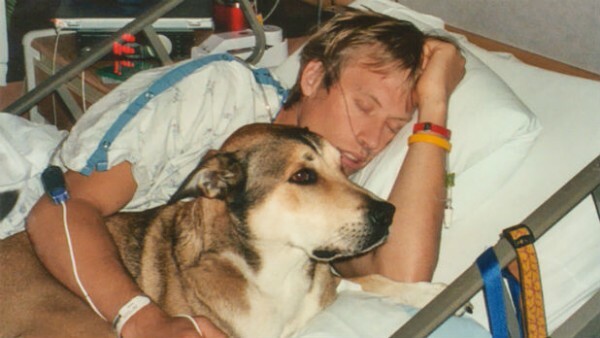 Filmmaker Ben Moon honored his dog, Denali, for helping him battle through cancer. The bond between a man and his dog is a wonderful thing. But nothing can change the cruel fact that we outlive our canine companions. And even though we may know this going into the relationship, saying goodbye is never easy. Denali, a short film that explores what it means to send our best friends out of this life with grace, has been a viral success. Since being released earlier this week, it’s been viewed close to 2 million times. Moon is indeed satisfied with the short film, but it took him more than a year to complete it. We talked with him about his creative process, his relationship with his husky-pit-mix Denali, and what’s next for the Portland-based photographer and filmmaker. For all its sadness, the film is surprisingly funny and has so many light moments. Was that something you insisted on from the beginning? That’s Ben Knight’s [the film’s director and editor] trademark. When you meet him, that’s him. He has this self-deprecating wit. It really takes you off your guard. He played it perfectly. And he’s a cat person, so the fact that he told a dog story so well is really impressive. Some of the most poignant images in the film come from when you were battling cancer. When were you diagnosed and what kind of cancer did you have? It was colorectal cancer. I was 29 when I finally got treatment, after a friend convinced me to go in. It was pretty advanced, stage three-plus. It was just about to go everywhere. If I’d waited any longer it would have been too late. I’ve been cancer free for 11 years now. How did you find a hospital for your cancer surgery where Denali was allowed in your recovery room with you? It was in Bend, Oregon. I was in the hospital for 10 days and they allowed it. I don’t know if it was just my nurses or what. But Denali would sleep on my bed and my folks and my sister stayed in my camper van outside. Knight wrote the script that accompanies the film. How did he manage to get Denali’s voice so right? He knows me really well and his girlfriend, journalist Katie Klingsporn, dug really deep. She asked questions and dug as much as she could to get the details. And I sent them five years of slides. I dug through everything I had and sent it all to them. About the same time, Ben’s girlfriend was diagnosed with MS and I think that really triggered finishing this and put everything in perspective. Was there a line in the film where you hear it and think, that is so Denali? It’s all so Denali in a lot of ways, but maybe the part where he’s talking about the insurance company and giving people rabies. He was such a gentle dog but he always had my back. You knew Denali’s last days were coming as you were finishing the filming. What was it like to revisit some of your old haunts? To be able to travel to my favorite places with him, the places we’d been traveling to since he was a puppy, was just really amazing. We spent the last two days before his death on the beach. He was not doing well, he could barely walk. But you saw him on the beach and he was prancing around like a puppy. It’s been over a year since you lost Denali. Have you thought about another dog? I’m taking a solid break from having a dog. Luckily, my girlfriend has an amazing dog that I get to spend time with, so that fills the void a bit. As a filmmaker, do you make money off of something like this? Not really. We actually chose not to put it up on YouTube because we didn’t want ads running in front of it. It’s a constant hustle in this industry but things come along in their own way. Just having a piece resonate like this means more than anything. I have a few other projects in the works, but now more than ever, I just want to work with good people who inspire me. You have a lot of high profile friends, like climber Alex Hannold. How have you managed to meet so many leaders in the outdoor industry? It’s a small, tightknit community. You just gradually encounter everybody. These days it really feels like a family. Going to the Patagonia headquarters feels like going to a family reunion. Do you have any plans to collaborate with Hannold? I definitely hope to. I love that guy because he’s just so raw. He just says what’s on his mind, and he’s this magnetic person. What’s the biggest thing you learned from making the film? This taught me that when you have the right people working on a project, it’s going to make it special. It also taught me to not give up on a project until it’s right. We almost released this project a couple of times but it wasn’t right. There was a time when my friends were saying to me, “I know this means a lot to you Ben, but good luck,” because I couldn’t get it right, but I’m glad we kept trying.